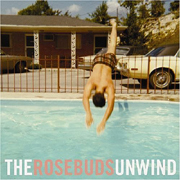 On their six-song EP entitled Unwind, The Rosebuds' deliver pop music in various forms. From the dazzling title track, gorgeous melodies making it an instant winner, to the garage-rock romp of "You Better Get Ready", and through the AM radio hit-gone-rock jaunt of "Edmund Street", The Rosebuds create a different song and style each time - while making it uniquely their own. It's both impressive and mysterious how they do it, but they do, and Unwind is a fine example of this. If you like pop music but like the bands to shake it up a bit, here is a band who knows their way around a pop song, as well as how to handle one, while shaking it up with various other influences. I'll give this a B+.